The traditional vehicles of Indonesia, popularly known as "becaks", which are basically pedicabs or tricycles, are rarely seen these days in the metropolitan city of Jakarta. Becaks cluttering the main streets of Jakarta were a common sight before 1994. After that, they were banned in the city because of their propensity to cause traffic jams. Consequently, becaks are widely missed by people living in housing complexes situated away from the main roads, because of the lack of public transportation means in the small and narrow streets of the city. But these traditional vehicles are still a favourite in cities and towns across Java island and elsewhere. In the nation's leading cultural city, Yogyakarta, which has numerous attractions and is the second most visited destination in Indonesia after Bali, the becak is being promoted as a tourism icon. The head of Yogyakarta`s tourism development office, Bambang Suwarmintarta, said the becak would continue to exist as a means of public transport even as Yogyakarta develops as a metropolitan city. "The becak has had a positive impact on the development of Yogyakarta`s public civilization," he noted. "The link between becak and the development of public civilization in Yogyakarta can be seen from several dimensions, namely becak as a mode of traditional transportation, becak drivers being responsible citizens of the city, and becak as the mover of economic activity," Bambang pointed out. "In the city of Yogyakarta, which covers a total area of 30.5 sq km, becak has become the essential mode of transportation for the city's people, especially for tourists who are keen to visit the cultural tourism sites," he said. Yogyakarta's cultural heritage includes, among other things, magnificent temples, ruins of palaces and monasteries, various traditions, cultural events, traditional folk and performing arts, and architecture. It is important to note that this is all part of the living culture of Yogyakarta that colours the daily activities of local inhabitants. Due to its rich cultural heritage, Yogyakarta has long been known as the cradle of Javanese culture, which continues to attract domestic and foreign tourists every year. Foreign tourists visiting Yogyakarta admit that they love travelling around by becak because it is "fun and exciting". 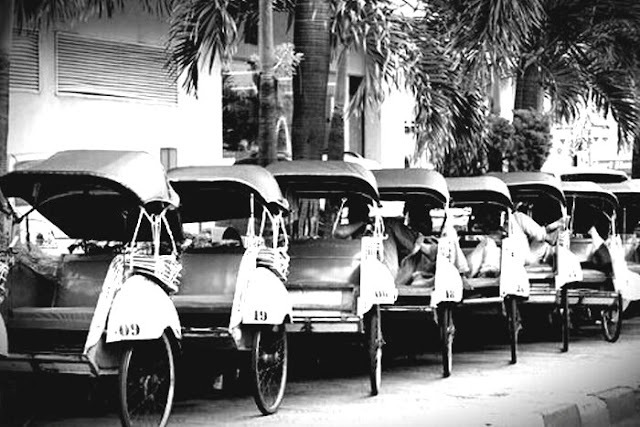 Besides, the city's becak drivers are friendly and always ready to take tourists around at reasonable fares. That is why, this traditional mode of transport has for years been a special attraction for foreign tourists. "I like travelling by becak every time I visit Yogyakarta because the drivers are friendly and never ask for unreasonably high fares," said Marianne Lammers, a tourist from the Netherlands. The Dutch woman from the city of Haarlem said she had visited Indonesia several times and Yogyakarta was her favourite destination. Some tourists even want to buy becaks and take them to their home country as souvenirs. Some Indonesian students who were invited to a barbeque at the house of Andrew Dodd in Melbourne, Australia, were surprised to see a becak parked in his backyard. "Wow! Where and how do you get this Indonesian traditional vehicle here?" asked Bambang Purwanto, one of the students. "I bought it in Yogyakarta when I went there some years ago," Andrew replied with a chuckle. Andrew is now a senior lecturer and the Convener of Journalism at Swinburne University of Technology in Melbourne. He has been a journalist for over 25 years and has worked in the broadcast, print and online media. His work often took him to Indonesia, particularly Yogyakarta. Andrew said he bought the becak in Yogyakarta, had it dismantled and packed in a box, and later got it reassembled after arriving at his Northcote home in Melbourne. Meanwhile, Yogyakarta Governor Sri Sultan Hamengku Buwono X said in Yogyakarta on Wednesday that becaks have been part of the district and the city`s economic system. "Becak is not the only mode of transportation but it has played a significant role in supporting the local economy," the governor noted. According to Sri Sultan, this non-motorised mode of transportation has attracted many foreign tourists to Yogyakarta. Sri Sultan said becak drivers in Yogyakarta have "directly or indirectly" acted as tour guides. "Besides, becaks are inextricably linked to craft vendors and tourist spots in the cultural city of Yogyakarta", he added. "Being a becak driver is an honourable job, just like any other profession," Sri Sultan explained. "During their journey, becak passengers have ample opportunities to enjoy the beauty of Yogyakarta and understand the local wisdom that is captured on the slogans written all over the city's walls," he said. Therefore, the governor urged becak drivers to be role models of traffic safety and give the best possible services to their passengers. "By giving the best possible service to their passengers, becak drivers can promote their mode of transportation as a cultural asset and a tourism icon in Yogyakarta," he added. More interestingly, a big rally of becaks, which was organized by Yogyakarta Regional Traffic Police Directorate, won the Indonesia World Record Museum (MURI) Award on Tuesday. Held at the North Square, the rally was attended by more than 1,000 becaks and becak drivers from all districts of Yogyakarta. The award was presented by the Indonesia World Record Museum chairman Jaya Suprana. In the beginning, the becak rally was conducted to make a national record but MURI wanted it to become a world record. "I don`t want this rally to become just an Indonesian record; it should be more than that : a world record," Jaya Suprana said. "The becak represents a philosophy of life. 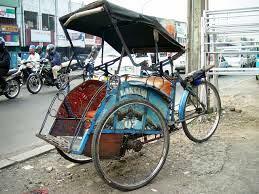 It is not hard to see how hard a becak driver works to eke out a living for his family," he pointed out. "Besides, the rally demonstrated that Yogyakarta was the only city and province in Indonesia to that upheld the dignity of becak drivers," Suprana stated. He noted that becaks were used in Paris as a mode of transport for tourists, although in limited numbers.